Defamation remains a criminal offence in Slovakia. Defamation (Criminal Code Art. 373): is defined as communicating false information about another person that can seriously damage the person’s reputation among fellow citizens, the person’s career, business, and/or family relations, or cause the person serious harm. The punishment is imprisonment for up to two years. If the act of defamation causes substantial damage, the maximum prison term is increased to five years. If the act causes large-scale damage, loss of employment, or divorce, the offender faces three to eight years in prison. It should also be noted that Art. 423 of the Slovak Criminal Code prohibits defamation of a “nation, its language or any race or ethnic group” in addition to “a group of persons or an individual due to their real or perceived affiliation to a race, nation, nationality, ethnic group, real or imagined origin, colour, political beliefs, religion or lack of religion”. The penalty is imprisonment for one to three years. If the act is committed by a member of an extremist group, a public official or with special motives, the penalty is imprisonment for two to five years. However, it should be noted that Art. 423 of the Slovak Criminal Code prohibits defamation of a “nation, its language or any race or ethnic group” in addition to “a group of persons or an individual due to their real or perceived affiliation to a race, nation, nationality, ethnic group, real or imagined origin, colour, political beliefs, religion or lack of religion”. The penalty is imprisonment for one to three years. If the act is committed by a member of an extremist group, a public official or with special motives, the penalty is imprisonment for two to five years. • For Art. 373 (defamation), there were 14 cases closed, leading to 9 convictions. These included 1 unconditional prison sentence and 4 suspended prison sentences. • Under the previous Criminal Code (Art. 206), there were 2 convictions, with one unconditional and one suspended sentence. • For Art. 373 (defamation), there were 12 cases closed, leading to 4 convictions, in turn resulting in 1 unconditional prison sentence, 1 suspended prison sentence, 1 criminal fine, and 1 one ceased sentence. • There were no convictions for defamation (Art. 206) under the previous criminal code. (The current Slovak Criminal Code took effect in 2006). • For Art. 373 (defamation), there were 17 cases closed, leading to 7 convictions, in turn resulting in three suspended prison sentences, 3 criminal fines, and 1 type of sentence listed as “other”. • There was one conviction for defamation (Art. 206) under the previous Slovak Criminal Code. A recent study by Peter Hanák examined the practical effect of Slovakia’s criminal libel laws on journalists. According to his study, there were no convictions of journalists for defamation between 2010 and 2014. While there were a number of investigations against journalists, in all of the instances either the police or the prosecutor’s office decided to drop the case . The study notes that the majority of persons who filed criminal reports for defamation were public officials, including three government ministers, numerous judges, including the president of the Supreme Court, policemen and other government officials. In general, journalists interviewed for the study stated that they did not experience a chilling effect due to the criminal cases, although one did admit to a fear of being jailed (in that case, the person who filed the criminal charges was the president of the Supreme Court). Repeated hearings and “stressful” communications were highlighted as negative experiences. The study reported widespread agreement among journalists that civil defamation suits posed a greater threat than criminal cases given the high damage amounts requested. • In September 2016, prosecutors questioned two journalists with the weekly magazine Trend, Zuzana Petková and Xénia Makarová, based on a criminal defamation complaint filed by Interior Minister Robert Kaliňák and former transport minister Ján Počiatek. The complaint was in relation to Trend’s coverage of the alleged involvement of politicians in an international VAT fraud scheme. Petková was quoted afterward as saying the prosecutor could not say which statement in the coverage was factually inaccurate . • In 2014, Ivan Ševčík, an agent with Slovakia’s Office for Fight against Organised Crime (ÚBOK), filed criminal libel charges against freelance journalist Júlia Mikolášiková after Mikolášiková quoted statements made by a court witness. The witness, testifying in a trial related to a housing mafia, stated that Ševčík was aware of the witness’ criminal activity. Among the public officials noted for bringing defamation cases against the media were Róbert Fico, the current Slovak prime minister, and Štefan Harabin, a former justice minister (2006-2009) and later president of the Supreme Court. VIA IURIS estimated that courts awarded Harabin €314,242 in compensation for defamation between 2006 and 2013, and awarded Fico €235,294 between 2007 and 2013. In 2013, Fico decided to conclude all his cases and withdraw all remaining claims. Since that time, the situation has slowly moved in a positive direction, according to a recent analysis published by IPI in cooperation with VIA IURIS. According to the analysis, Slovak courts now appear to produce better-reasoned decisions and to be more aware of the need to carefully assess the conflict between freedom of expression and personality rights. They also take into greater account the standards anchored in the jurisprudence of the European Court of Human Rights (ECtHR). As a consequence, the protection awarded to public officials against defamation in the media has become less excessive, with less exaggerated financial compensation. Still, much depends on particular judges and courts, so not all decisions contain exemplary reasoning, and some continue to give excessive protection to personality rights. Notably, the Constitutional Court, in its ruling no. I. ÚS 408/2010, referred to the case law of the ECtHR, according to which compensation for non-pecuniary damage must be reasonably adequate to the damage the reputation of the victim suffered (e.g., Tolstoy Miloslavsky v. the United Kingdom), and courts must base the amount of compensation on evidence indicating the intensity of the damage (e.g. Flux v. Moldova, Steel and Morris v. the United Kingdom). In the decision noted above, the Constitutional Court stated that a Slovak regional court had failed to comply with ECtHR case law when the regional court stated that “[i]t is not … possible that the court in awarding the amount of the compensation for non-pecuniary damage compares how judges proceeded in awarding of the compensation for non-pecuniary damage in other cases”. In this context, the Constitutional Court pointed out the ECtHR’s ruling in Público-Comunicacáo Social, S.A. v. Portugal, according to which the amount of compensation in a particular case must take into account the amount of the compensation granted by the national courts in other cases of damage to good reputation. With respect to determining the amount of compensation for non-pecuniary damage, the Constitutional Court also drew attention to the ECtHR’s decision in Iltalehti and Karhuvaar v. Finland. In that case, the ECtHR stated that in determining the amount of compensation for a violation of personality rights, courts should take into account the amount of compensation awarded for physical injuries or for the damage suffered by the victims of violent acts. According to this ruling, compensation for violating personality rights should not, without the existence of serious and sufficient reasons, exceed the maximum amount of compensation awarded for physical injuries or acts of violence (the relevant rules state that compensation in such casesis generally limited to 10 times the minimum wage of €352, i.e., €3,250. In the case of damage of physical harm or psychological trauma, the legal limit is €30,000). The Constitutional Court underscored these considerations in reference to the aforementioned case. It found that the the amount of non-pecuniary damages awarded to the applicant – €25,000 – was disproportionately high and that even without regard to any conclusions on the merits of the case, the Constitutional Court concluded that the regional court had inadmissably interfered with the applicant’s right to freedom of expression and the right to free dissemination of information. For the purposes of this research, nearly a dozen civil defamation cases involving the media between 2011 and 2016 indicative of trends were selected and analysed. Compensation awarded in the majority of these cases was €10,000 or below. A significant exception – at nearly five times the next-higest award – is a €99,582 judgment awarded in 2011 by the District Court of Trebišov upon remand by the Regional Court of Košice. The award was made to a businessman who had sued the broadcaster TV Markíza for alleging that the businessman had taken part in bankruptcy fraud. 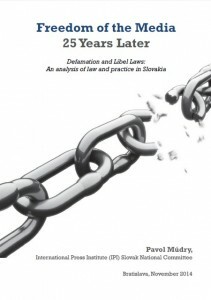 Read the full analysis “Damages in Civil Defamation Cases in Slovakia”. This entry on civil defamation laws in Slovakia was complied in cooperation with the civil association VIA IURIS. Information for Slovakia was originally collected by IPI as part of the “Out of Balance” report, published in January 2015 with support from the European Commission and incorporating research contributed by Center for Media, Data and Society at Central European University in Budapest and by the SHARE Foundation in Belgrade. This entry was later expanded and updated by IPI as part of a study commissioned by the Office of the Representative on Freedom of the Media of the Organization for Security and Co-operation in Europe (OSCE).